Snow swirled and settled in the garden throughout the day. 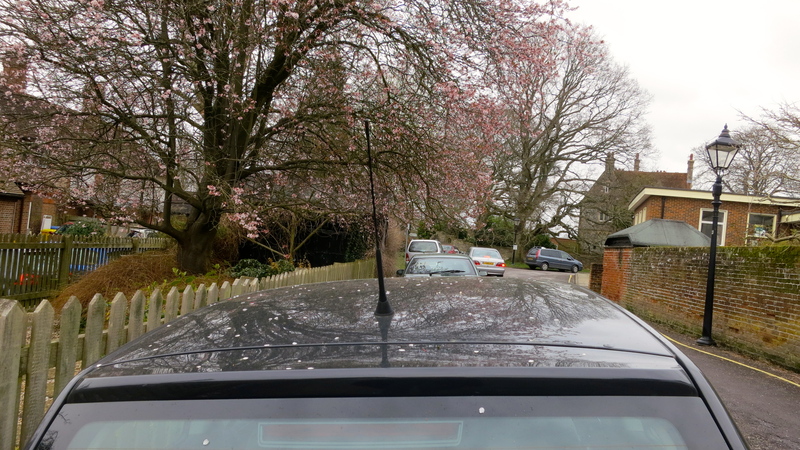 Flurries flew about intermittently in Romsey this morning, but all that settled there was cherry blossom. This was when I walked around the town whilst Jackie attempted to track down fish for the visit of Sam and Holly and Malachi and Orlaith on Wednesday. 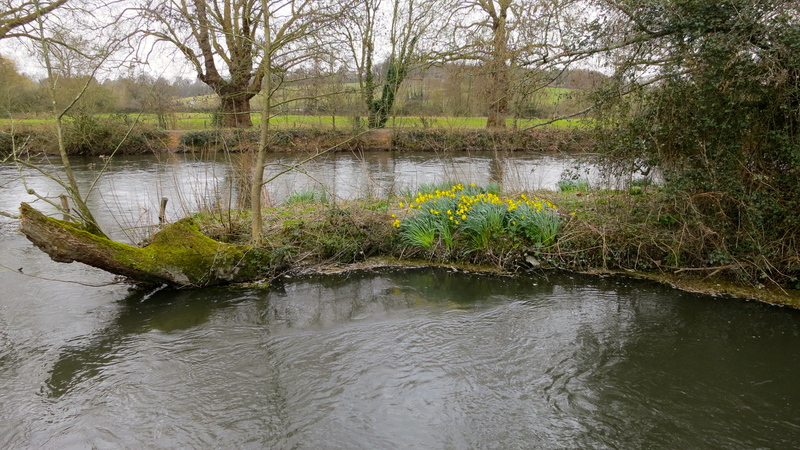 I wandered around the Abbey and its vicinity, including the War Memorial Park and the bank of the river Test. It was blustery and cold. 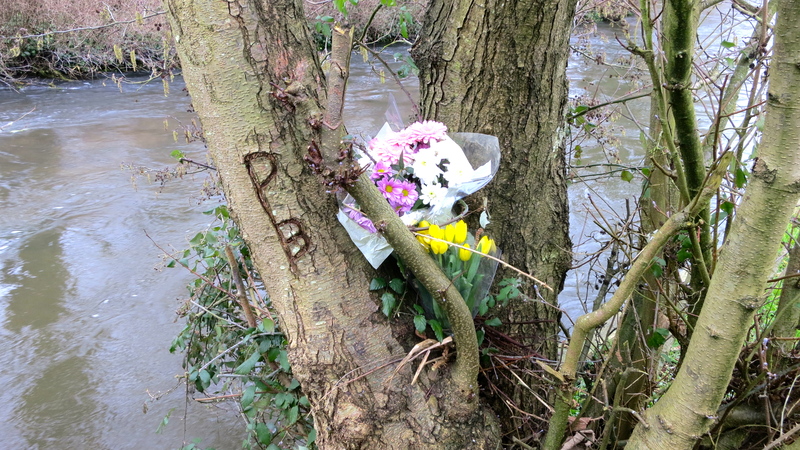 Having just passed through a gateway onto the narrow riverside bearing a notice warning of deep water and asking for the gate to be kept closed, I came across two bouquets fastened to a tree bearing carved initials. I wondered what the story was. Certainly the river flowed very swiftly. Further along, a host of daffodils bravely rivalled the clumps of snowdrops now clearly more in their element. 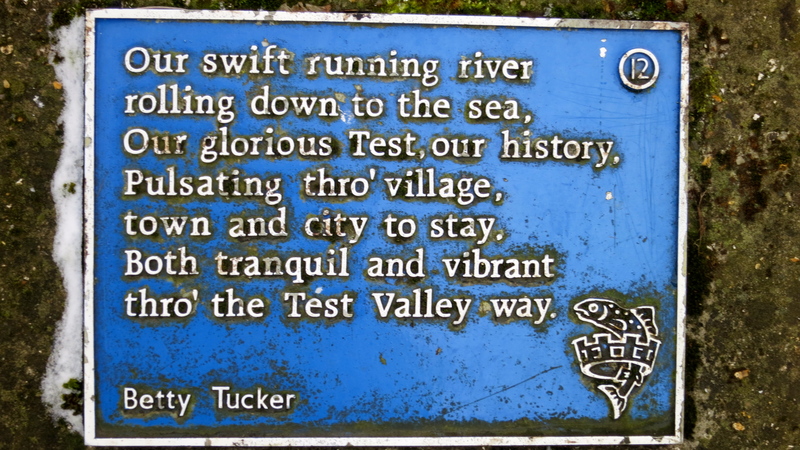 At least around this area of Romsey there is a collection of plaques embedded at intervals in the pavement and on walls and copings, each bearing a different few lines of poetry. Since those by the river have been placed in spots relevant to their text, I imagine that is so of all of them. Our other reason for choosing Romsey as today’s shopping centre was the toyshop. Before leaving the town we spent ages trying to decide on Malachi’s birthday present. Hopefully we got it right in the end. We then had to find the fish, for there had been none available in Romsey. 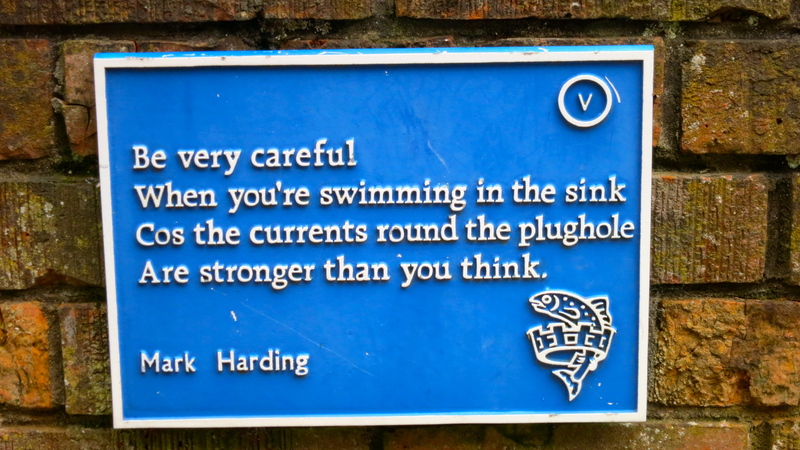 Perhaps I should have tried my luck in the river. Aiming for Totton, to continue the search there, we missed the turn-off, which turned out to be fortunate, for we stumbled across a Morrison’s superstore where we found the smoked haddock we were seeking. 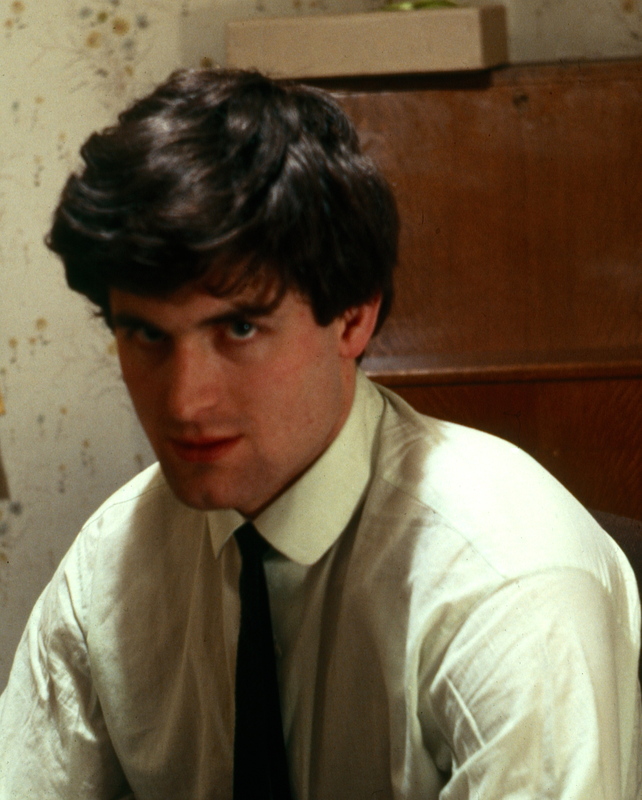 Photo number 4 of ‘Derrick through the ages’, in which I seem to be attempting to simmer, was taken by Jackie in 1966 at Shirley Oaks. These were the old children’s village style homes for young people in Local Authority care. Near Croydon, this was a laid out estate of forty two large houses, called cottages, each accommodating twelve children. At that time the project also included a swimming pool, an infirmary, a laundry, a general store, a junior school, and even an unused mortuary. The individual houses were staffed by ‘housemothers’, many of whom offered ‘families’ of children long term consistent care. Jackie was one of these carers, in ‘Laurel cottage’, and my introduction to the world of Social Work that was to provide me with a new direction ( see 18th July 2012). Long since out of fashion as a method of child care, these buildings were sold off to form an exclusive, expensive enclave. The seclusion that had been considered too institutional, isolating and ghetto-like for troubled children, had become an attraction for those wealthy enough to buy their homes. Shirley Oaks children were given no experience of life outside the institution until they were thrust into secondary school. They didn’t go to the public baths and pay their entrance fee. They knew no launderettes. A daily truck provided an eneuretic service for the wet sheets which were left outside the back door. Their shop issued the housemothers with weekly order forms on which they ticked what they needed and collected it once a week. No money was handed over. No ‘outsiders’ attended their school. When a group of boys from outside began to visit a girl in Jackie’s care, a bunch of Oaks boys attacked them with such violence that there was blood on her doorstep. I was inspired to attempt to do my bit in changing all this. Perhaps I made a difference to some young lives. Those children’s housemother made a very tasty chicken jalfrezi this evening which she ate with Hoegaarden and I with Cepa Lebrel reserva rioja 2008. 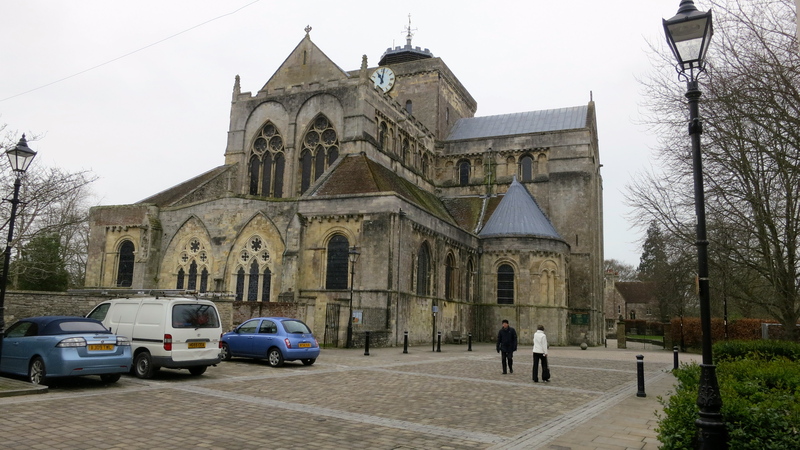 This entry was posted in Uncategorized and tagged River Test, Romsey, Romsey Abbey, Shirley Oaks by derrickjknight. Bookmark the permalink. Hello Alan. Jackie worked in Laurel cottage and left about the same time as you did, so I am afraid we can’t really help, but wish yoiu well in your search.